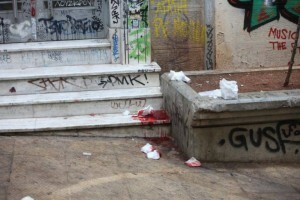 In the early hours of Tuesday, June 3rd, at about 02:30, unknown people fired at least 5 shots at the main entrance of the squatted social centre K*VOX. Two of the bullets pierced the outer metal blinds, shattering the glass front entrance door. [see photo] Luckily, at the time, no comrade was inside the squat. 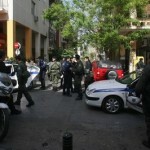 Lately, the K*VOX —along with residents, collectives and fighters from the neighbourhood— has taken a series of initiatives to act against the mafia gangs and the drug trade in Exarchia, which is carried out with the police’s tolerance and cover-up. 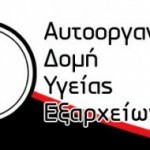 It’s addressed to the local community of Exarchia, doctors, psychologists, nurses, pharmacists, but also to any other resident who would like to help. Part of the constant flow of solidarity demonstrations with squats that happen on a near-daily basis across the entire country. 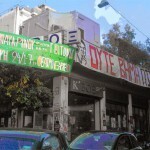 Demonstration in solidarity with K-Vox [the occupied anarchist social centre by Exarcheia square]. Hands off occupations. 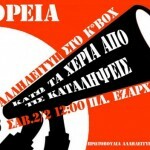 Saturday Feb 2, noon, Exarcheia square. More than 1,000 people at Exarcheia square solidarity concert. VOX, the social centre that was evicted and sealed off by police yesterday, has been reoccupied by hundreds of people in solidarity tonight. People tore down the steel plates sealing off the social centre and as of midnight (GMT+2) there were approx. 1,000 people attending the solidarity concert called by the centre’s collective. There are police forces in the periphery of Exarcheia but there does not seem to be any attempt for them to intervene as of yet. At approximately 06.50 GMT+2 on Friday morning, heavy police forces conducted simultaneous raids at two newly occupied anarchist spaces in the neighbourhood of Exarcheia: the building at 60, Valtetsiou str and the building of the abandoned VOX cinema by Exarcheia square. The latter had been occupied for a few weeks and its opening event was planned for this Saturday.